In this town, we can almost always find the freshest tuna. This colorful salad is so quick and easy; it is a perfect cool lunch dish or a stunning 1st course. Start with a slab of tuna like this in the photo. Cube about 200 grams or 1/2 pound of the tuna, and toss with 1 tablespoon of sesame oil, 1 tablespoon of honey (or brown sugar), and 1 tablespoon of good quality soy sauce. Build the salad by layering the greens, the tuna cubes, mango cubes, avocado cubes. 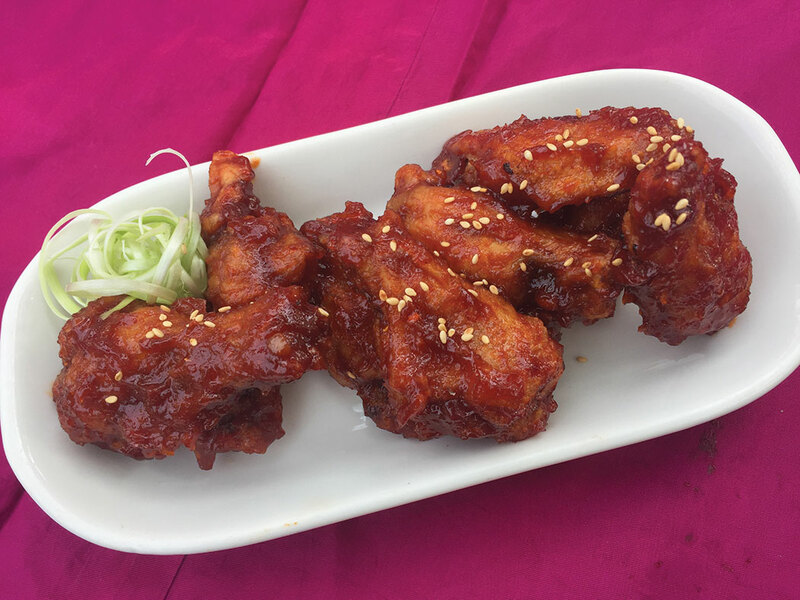 Drizzle with Japanese sweet sauce or homemade mixture of soy and honey. Top with sesame seeds and scallions. The seasonings can be adjusted to taste where the main flavors are from the soy sauce, the honey or brown sugar, and the sesame oil. 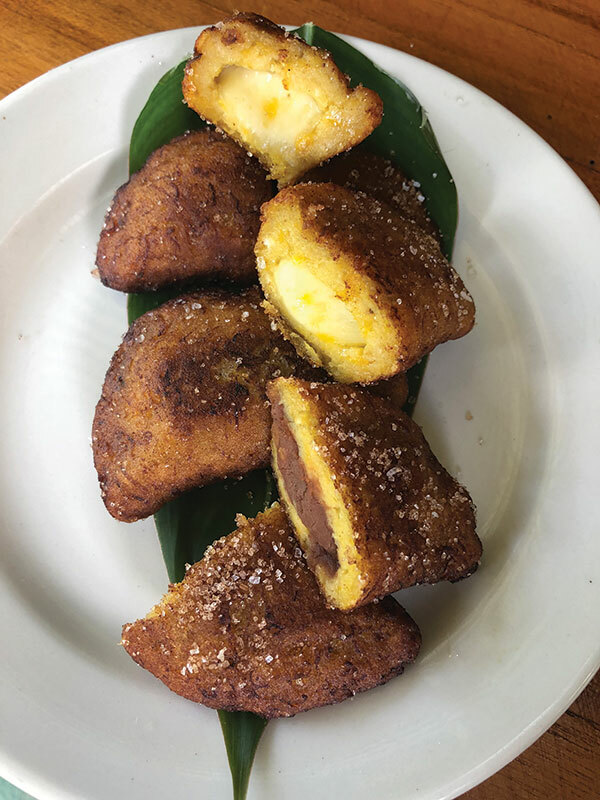 Sometimes nicknamed “Chindu” cuisine, it’s the result of Chinese immigrants in India who adapted their recipes to local flavors and produced some of the happiest accidents of Asian-fusion. This sauce combines sweet soy, garlic, ginger, and spicy peppers. Ask your butcher for “muslos deshuesados,” or boneless chicken thighs. They will remain juicy and delicious throughout the cooking and reheating of this dish. Cut the boneless thighs in 1 inch pieces and prepare batter ingredients. Coat the chicken as seen in picture. Fry in batches in a shallow pan with the vegetable oil. Drain on paper towels. Prepare sauce. Heat oil in a pan and fry the green onion, garlic, bell pepper, ginger, and jalapeno until fragrant. Add the sriracha ketchup, soy sauce, and sugar. Add the water/cornstarch mixture and heat until the sauce thickens. Mix in the fried chicken pieces, garnish with cilantro leaves or sliced green onion tops, serve with rice or noodles. This dish called Mujadara makes me think of a middle eastern version of “gallo pinto.” The caramelized onions are the key and they should cook until they reach the darkest brown without burning. Don’t forget the fun toppings listed below that will add panache to these humble ingredients. Place lentils in a pot with knob of ginger and cinnamon stick. Cover with water by 1 inch and set to boil. When reaches a boil, lower the temperature so the lentils stay whole and simmer for about 20 minutes. They should be cooked but not mushy. Drain in colander. Heat 1/2 of oil in a frying pan and add cumin seeds, peppercorns and onions. Cook onions until they are dark brown and some are turning crispy. This may take 10-15 minutes. Season with salt. Remove half of the onions and save them for the very end. Wash and drain the basmati rice and fry in the onion-cumin-pepper oil for a few minutes then add 3/4 cups of water and let the rice cook. To assemble the dish, heat 3 tablespoons of oil, add lentils, ground cumin and ground cinnamon, stir in the cooked rice, and finish by topping with the reserved onions, lime juice and any of the following options. Chopped nuts such as pistachios, almonds, walnuts, cashews. We once had a quaint little Peruvian restaurant downtown Quepos where this became my favorite chicken dish. 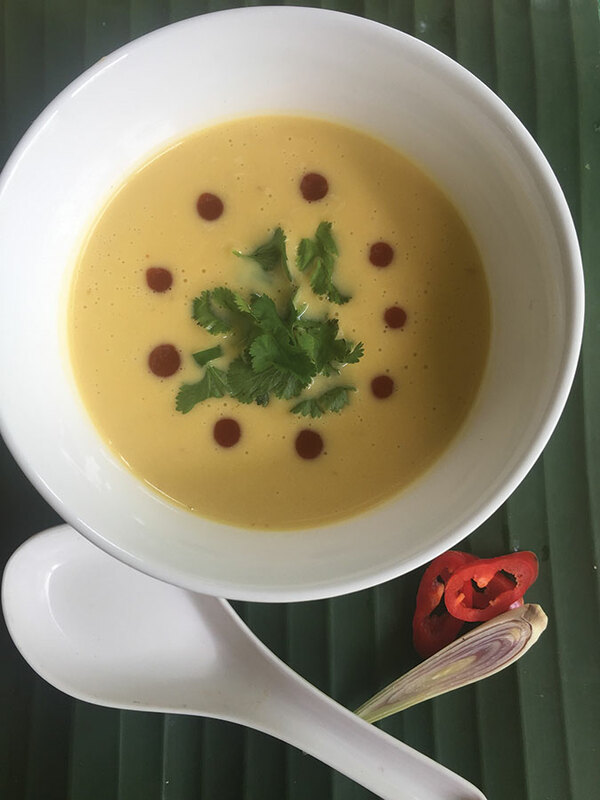 It is creamy and spicy with an unusual mix of walnuts, Parmesan, and these orange “aji” peppers that can be found in produce markets from time to time. I have also found this “Ajinka” sauce that I highly recommend to anyone who, like me, enjoys collecting hot sauces. Boil potatoes and eggs until cooked. Peel and set aside. Boil chicken breasts in chicken broth and strain when fully cooked while reserving the stock. Let cool before shredding all of the meat. Cook the aromatics: onions, garlic, aji peppers in the oilve oil until very fragrant, and then allow to cool. Meanwhile, soak the bread slices in the evaporated milk. Place cooked aromatics, leftover stock, bread with milk, and walnuts in a food processor. Blend until smooth. Return to pan and bring to a slow boil. Stir in the shredded chicken; adjust the seasoning with salt and pepper (I prefer white). Aji de gallina is usually served with a couple wedges of boiled potatoes, a couple wedges of hard boiled eggs, steamed rice and black olives. Here is a little a little snack that is both sweet and savory. I’ve adapted it from a Colombian recipe to be gluten free and possibly vegan if the cheese is substituted with beans. First you start with a medium ripe plantain. Peel and boil the plantain for about 20 minutes and allow it to cool. Drain and mash with a fork. Add, ¾ cup of corn flour (or masa rica found in stores) and ½ teaspoon of salt. Mix until you obtain a dry dough that doesn’t stick to your hands.Roll into 8 to 10 little golf ball sizes. Flatten into circles and place one pinch of shredded cheese (mozzarella is recommended) or one small dollop of refried beans for the vegan option. 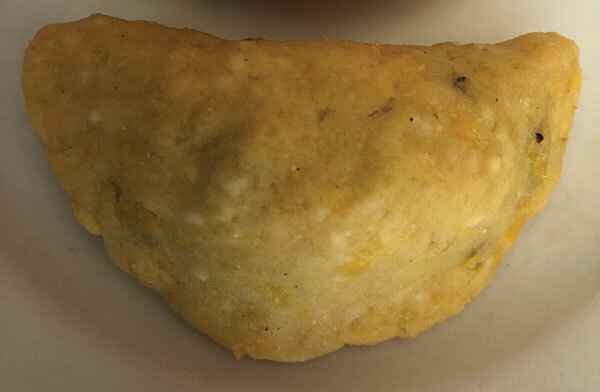 Fold over to create a half moon shape, and pinch around the edges to seal. Fry in cooking oil until golden brown and drain on paper towels. Sprinkle with a mixture of salt, sugar, and cinnamon and serve. The compressed fruit pulp of the tamarindus indica tree is available in any produce store. 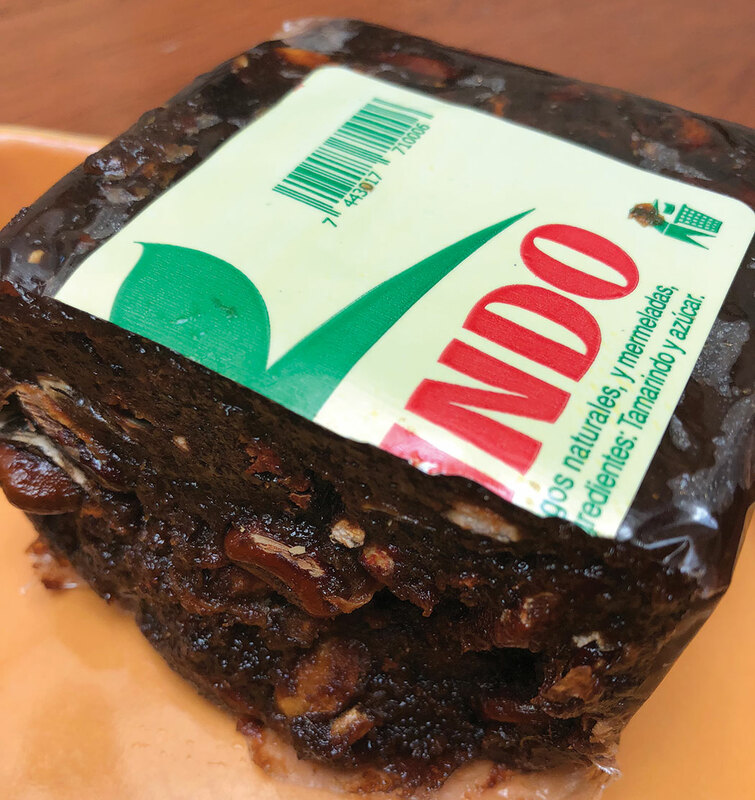 Ask for “tamarindo,” pronounced just like the beach town in Guanacaste, or look for the brown packet as shown in photo. It is a popular ingredient in south Asian recipes; it has an incomparable blend of sweet and sour best described as a full flavored and complex lime juice. It is packed with anti-oxidants, digestive aids, and vitamins that cover the entire alphabet. Locally, ticos turn these tasty fruits into refreshing drinks—fresco de tamarindo. This sauce is excellent with shrimp, fish, or chicken. Crispy garlic and cilantro leaves add the finishing touch that is so popular in Thai dishes. Mix tamarind pulp with hot water so that it becomes loose. Strain with fine sieve. You will need 1/3 cup of the thick liquid, free of seeds and fibers. Take 5 garlic cloves and thinly slice to deep fry. Finely chop the other 5 cloves or use a garlic press. Pour ½ cup of vegetable oil in a small frying pan and fry the garlic slices until they begin to brown. Quickly strain the oil into a larger frying pan with a metal strainer. Be careful because garlic can burn easily. Dry the shrimp, fish, or chicken before dredging into the cornstarch, salt, and pepper. Add the rest of the cooking oil to the strained garlic oil to pan fry the shrimp. Fry until golden and set aside on paper towels. Keep warm while making sauce. In a saucepan, heat a small amount of cooking oil, add the garlic, the carrots, the onions, the green onions, the bell peppers until the vegetables are fragrant. Add tamarind, sugar, and fish sauce. 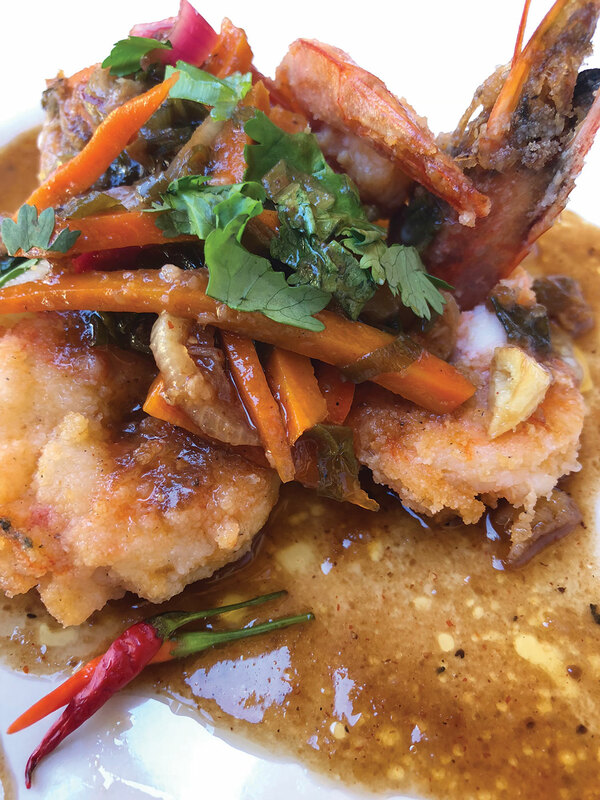 Pour sauce preparation over the crispy shrimp and garnish with crispy garlic and cilantro leaves. Serve with steamed jasmine rice. This is a refreshing salad with contrasting colors and textures. Try adding cooked meats, seafood, or roasted veggies for a perfect lunch bowl, or serve it alongside a composed meal. Make dressing by mixing lime juice, sugar, fish sauce, and garlic. Place cucumber and tomato slices in a bowl, toss with dressing and herbs. Let sit for 5 minutes. Sprinkle with chopped peanuts and serve. If you are able to find a perfect grill, preferably charcoal, don’t hesitate to try these classic Korean culinary delights. The bulgogi meat is sliced thinly and only needs a few hours to marinate. 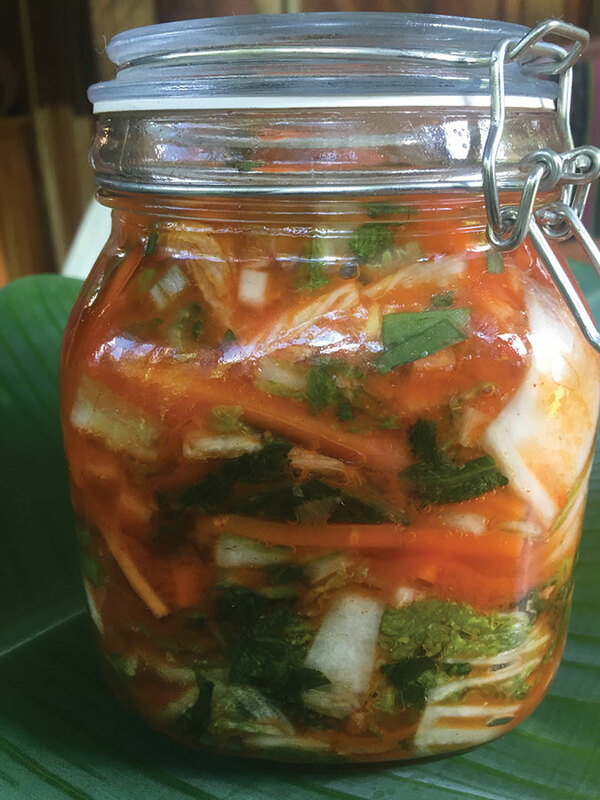 The kimchi is a fun science project to share with kids (and adults) and awaken our foodie curiosity. Although soy sauce, sesame oil, gojujang paste, ginger and garlic, might not have been readily available in those times, I believe that Gengis Khan and his raiding mongols ate something similar… even the fermented pickled cabbage “kimchi” was essential to their diet. First we must thank John Montagu (1718-1792), the 4th Earl of Sandwich, who had the genius idea of encasing cold meats in between two slices of bread so that he didn’t break from the gambling tables for a snack. Of all the inventive meat-and-bread creations since this historical milestone, the Vietnamese Banh Mi is one of my favorites. Fresh and crusty bread, and the sweet pickled carrots and cucumber (daikon too if available) and cilantro are key, the rest can vary according to taste. This recipe is the authentic street vendor version. About 9 inches of fresh French baguette cut lengthwise leaving both halves still attached. Mix all of the above and let stand at room temperature for 20 minutes, drain before using. This is a crowd-pleaser, and a creative way to serve leftover chicken (or other proteins). The rice vermicelli, shredded vegetables, sweet, sour, and spicy vinaigrette will make you want to finish the bowl. 1/2 kg of cooked chicken or other meat, sliced thinly. Boil water in a large pot for the vermicelli. When pour contents of the package into boiling water for 2 to 3 minutes until soft, strain, set aside. In a large pan or wok, preferably non-stick, fry the garlic, ginger, and scallions until fragrant in the vegetable oil. Add the shredded cabbage, and the celery and carrot. Stir fry the vegetables and then add meats, noodles, brown sugar, and liquid ingredients. Mix all very well and serve warm or cold. You can garnish with chopped nuts, cilantro, sesame seeds. Yum! Put the first 6 ingredients in a pot with approximately 2 quarts of water, and boil for one hour until the pumpkin is very soft. Drain the solids while saving the stock. Remove and discard lemongrass, ginger galangal, and kaffir lime leaves. Scoop out the pumpkin flesh from the outer peel and place in blender. Add the cooked garlic cloves and puree with the cooking liquid. The mixture should be smooth. Now add the lime juice, Nam Pla, brown sugar, and coconut milk. Amounts can be adjusted to taste. Garnish with a small amount of finely sliced scallion, chopped cilantro, Siracha drops or scallion oil. I am often asked: what is tofu, and how is it used? Tofu is a bland looking and bland tasting hunk of soy cheese that nobody should consider a pantry staple unless you’re vegetarian, vegan, or lactose intolerant. But let’s reconsider for a moment. Tofu is actually a magical ingredient that is a shape shifter, a rich protein, a product of coagulated soy milk that can embrace any sauce or flavor, sweet or savory, a vehicle for endless creations… Here is a surprisingly simple appetizer that makes everyone smile before they fall in love with tofu. Place tofu on a few paper towels to air-dry for a couple hours so that the moisture doesn’t make the oil splatter. Quickly blanche the bean sprouts in boiling water in order to keep their white color. Drain and combine with carrots, cilantro, and peanuts. 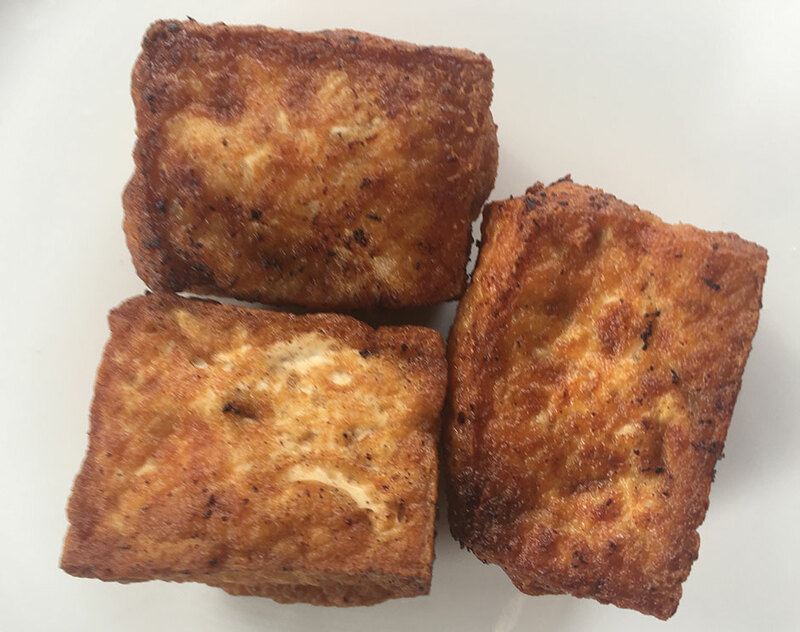 Cut tofu carefully into 6 rectangles and deep fry on all sides. Cut the cubes in half and scoop out a small amount of the soft middle. Stuff the halves with the bean sprout mixture. 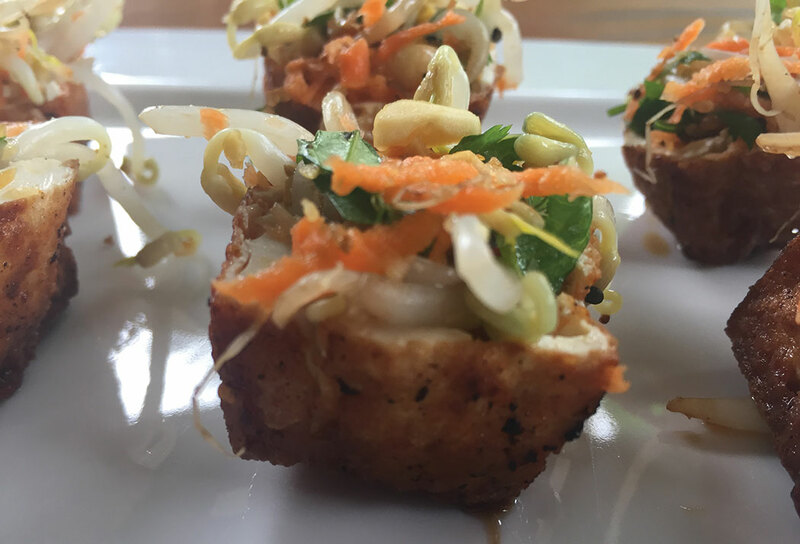 Serve with slightly sweetened soy sauce and you will have a fun appetizer for your vegetarian and vegan friends. Using leftovers from holiday meals is just another way to prolong the feast. Here, the turkey carcass and meat scraps can become a wonderful hearty soup to serve with rice and plenty of hot sauce. All gumbos start with a roux which means browning flour in oil. I use a low flame and plenty of patience for stirring the pot. 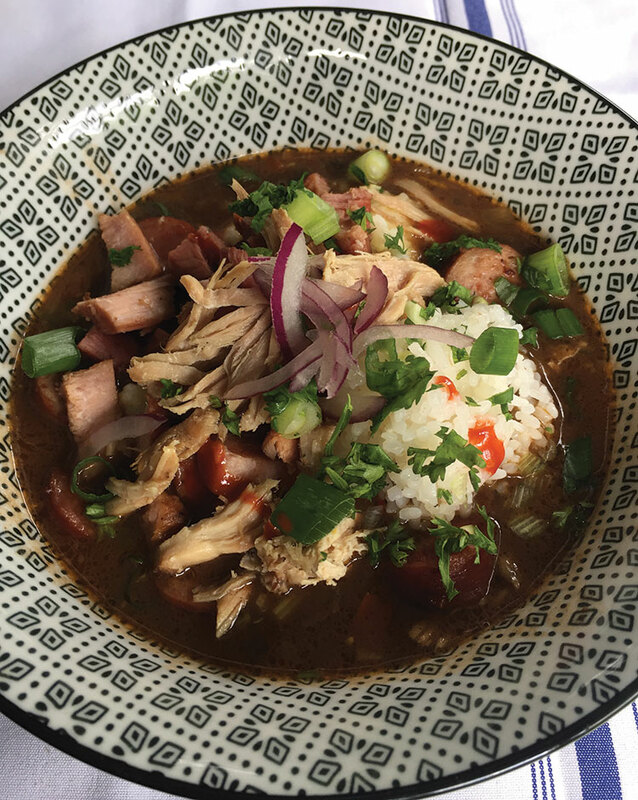 When the roux becomes dark chocolate brown, you must add that Cajun “holy trinity” which is chopped onions, green peppers, and celery. Then you follow with the stock, and finally the meats. The meat choices are really up to you and what you have on hand. This is an American-Chinese favorite, Asian fusion at it´s finest. Slice chayote & carrot into small matchsticks. Make a dressing with Thai fish sauce, white sugar, and lime juice. 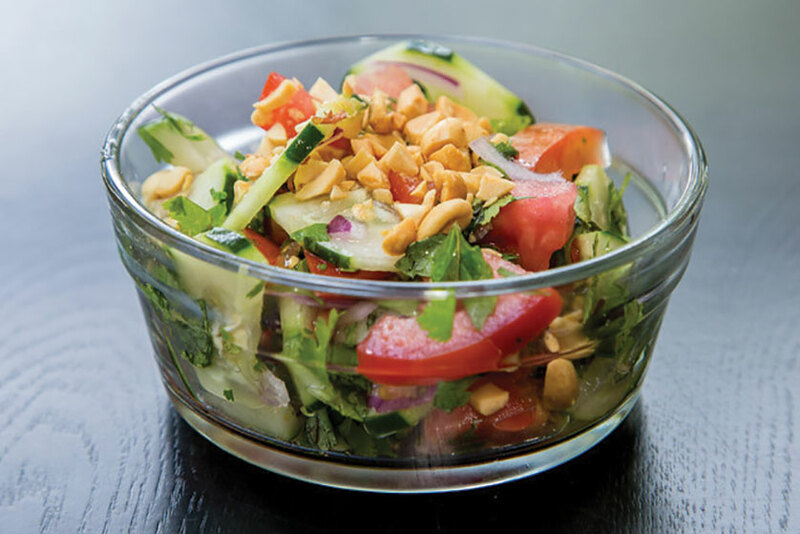 Pour dressing over matchsticks and garnish with chopped peanuts and cilantro. Mix together the flour, cornstarch, baking soda and powder, soy sauce, sesame oil, vegetable oil, and water until a smooth paste is formed. Add the chicken pieces and let sit for about 30 minutes. In a shallow pan, heat 2 cups of cooking oil and fry the chicken pieces in batches until golden. Keep warm. In a saucepan, fry the garlic and ginger in a little bit of cooking oil until fragrant. Add the rest of the ingredients and bring to a boil. Mix 3 tablespoons of cornstarch into 1 cup of water and mix well before adding it to thicken sauce. Pour over warm chicken nuggets and sprinkle with toasted sesame seeds. 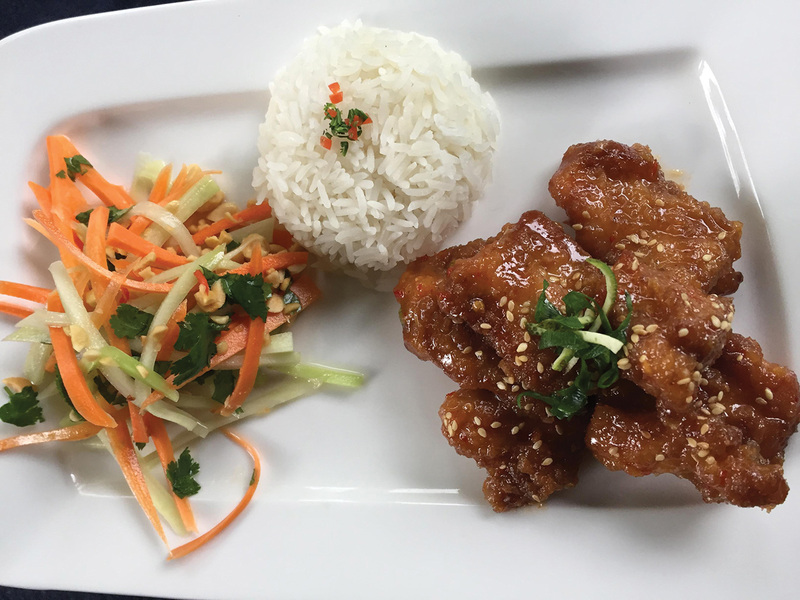 Serve with steamed rice and Thai-style chayote slaw. Korean gochujang paste is my new obsession: think of a blend of sweet and spicy miso paste. I’ve seen it once at the mini price store (some years ago sighhh), but it does exist in San Jose. If you find it, grab it and share it with your loved ones. A small amount goes a long way. Split the wings into drumettes and wingettes, discard the tips (good for making stock). Pat dry with paper towels and let sit for a few hours in salt and pepper. Pat dry again before tossing in cornstarch to coat evenly. Heat oil until it spatters and cook wings in several batches until well done. This should take at least 1/2 hour depending on size of wings. Check for doneness.